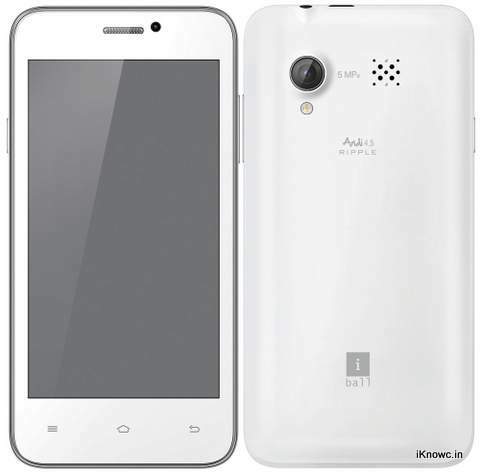 iBall mobiles has launched a new android smartphone the Andi 4.5 Ripple. The new Andi 4.5 Ripple comes in two variants, 3G and 2G. It packs with a 4.5 inch FWVGA IPS display and gains the strength from 1.3GHz dual core CPU based on Cortex A7 architecture. It runs on Android v4.2 Jelly bean OS and comes with 5MP primary shooter. Following the latest trend, it also comes with Dual SIM support. The 2G variant of the iBall Andi 4.5 Ripple is priced at RS 5,499 and 3G variant cost you about RS 6,399. The phone still looks affordable and lusty at this price. It would compete with Spice Mi 436 and Lava Iris 503 e.